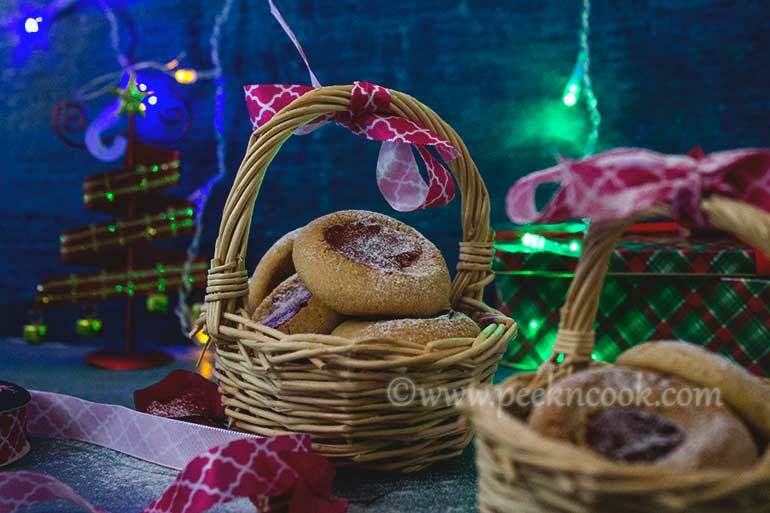 Cookies are small, flat round or any kind of shaped baked treats. They can be in many different flavors and shapes. There are many different types of cookies in all over the world. Here this cookies are kind of Indian. Keep the butter in room temperature for 1hr. Then mix the sugar , butter , vanilla extract, salt & beat for 15 minutes. Then add the flour & baking powder to it and make a soft dough. Preheat the oven on 375 F.
Now make small balls from the dough and put them on baking sheet. And make sure the cookies have enough space to expand. Now press each small balls with your thumb and make a small dent and put some jam on it. Bake the cookies for 15 -20 minutes. After 20 minutes the cookies are ready for serve.